The complex social behavior of baboons ensures that there are constant actions amongst the troop members. When you spend some time understanding this you will notice alliances and cliques amongst them as well some deceit. They vary in color from brownish grey to dark brown or even black. Adult males have a dark mane on the neck and shoulders. Habitat - where do baboons live? 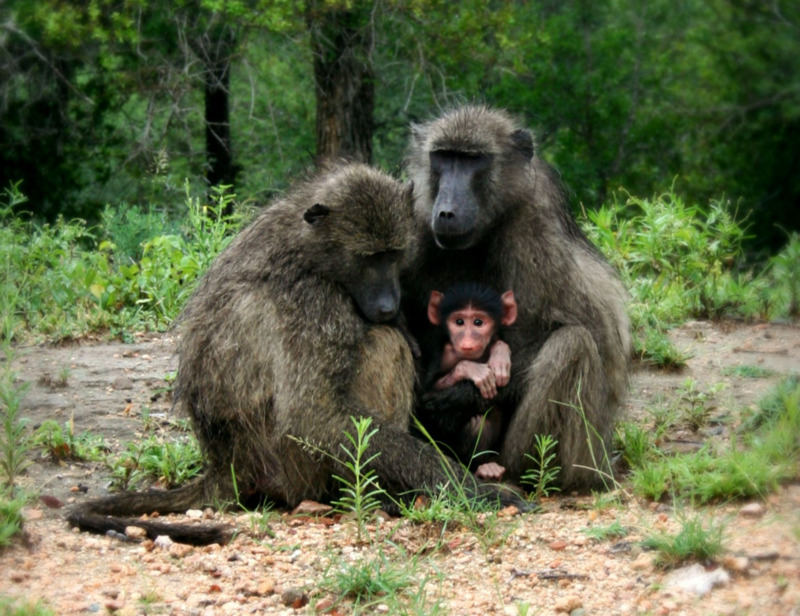 Baboons live in any habitat where refuges like tall trees and cliffs as well as water occur. They eat almost anything but mostly fruits and seeds. 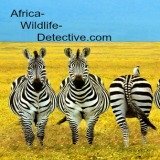 They are also carnivorous and will eat insects, rabbits and hares, small birds, vervet monkeys and small antelopes lambs if they get the chance. A youngster learns what is best and safe to eat, and how to go about getting it, by watching its mother and the other members of the troop. 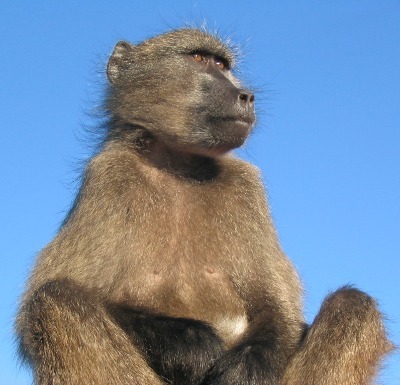 What social structure do baboons have? These African animals display very complex social behavior. There are different dominance hierarchies among the males and females. A dominant male leads this well-developed social structure. A male’s dominance depends on his physical condition. The benefit of being a high-ranking male is that they get first choice on feeding sites and preferred access to females. You will often see males play with and groom infants. They sometimes do this as a way of avoiding aggressive dominant challengers. There is also a social hierarchy among the troop females. In the case of females this hierarchy seems to be more fluid because the status of each female depends on factors like her reproductive condition, which male she has as a mate and also whether she has a baby. There is a complex range of interactions among its members that maintains this social structure. If you watch these interactions long enough you can identify the various alliances within the group. The highest-ranking male is the most aggressive member. Low-ranking males occasionally form coalitions with one or two partners to gang up against dominant males. 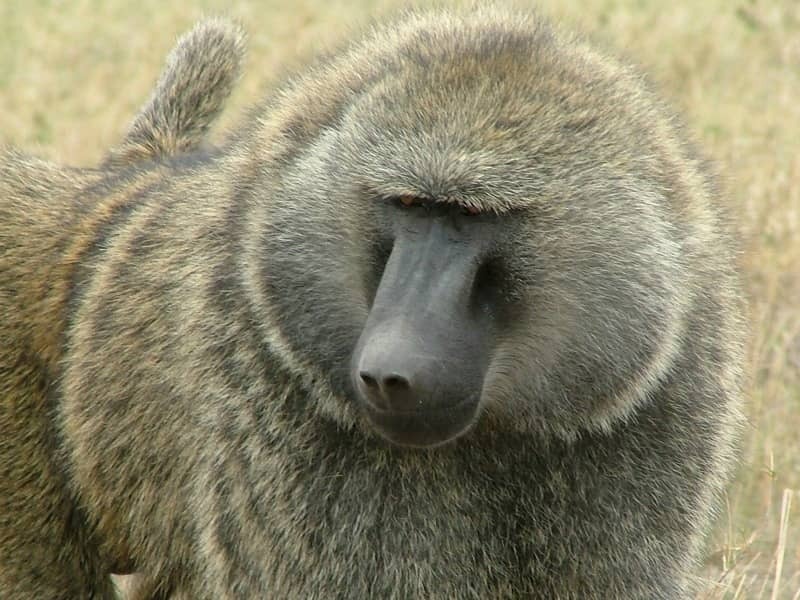 You can identify a submissive baboon when it opens its mouth slightly, and pulls its lips back in a grin. How do baboons communicate with each other? A boon who yawns with its eyes shut is relaxed and happy. If it yawns widely with its eyes open it is slightly tense and excited. They have an enormously wide range of vocal and visual signals that they use to communicate. Facial expressions form the basis for most of their social interactions and communications. If it smacks its lips while narrowing its eyes and keeping its ears back is in a friendly mood. It signals mild aggression by opening its mouth and drawing its lips back slightly without exposing its teeth. Baboon communication is sometimes very complex and subtle. A stronger threat is given by thrusting the body and head forward with the eyebrows lifted. This is often done while shaking tree branches. The most serious threat signal is a yawn that displays the canine teeth. 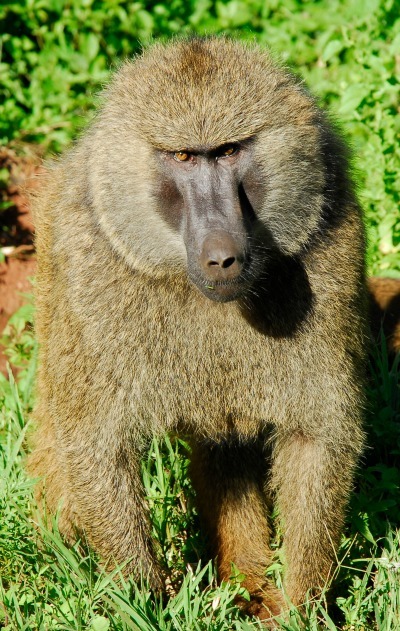 Presentation of the rump is used as an appeasing signal by baboons of both sexes. Their make barking sound as an alarm and an aggressive signal against other troops. They are socially intelligent enough to also use dishonest signals intended to deceive. A youngster will sometimes scream in apparent distress as though being attacked. 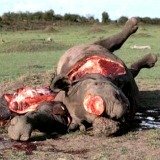 They do this to incite its mother to attack another female who has some food that the youngster wants. False alarms are used by subordinates to distract attacking animals. 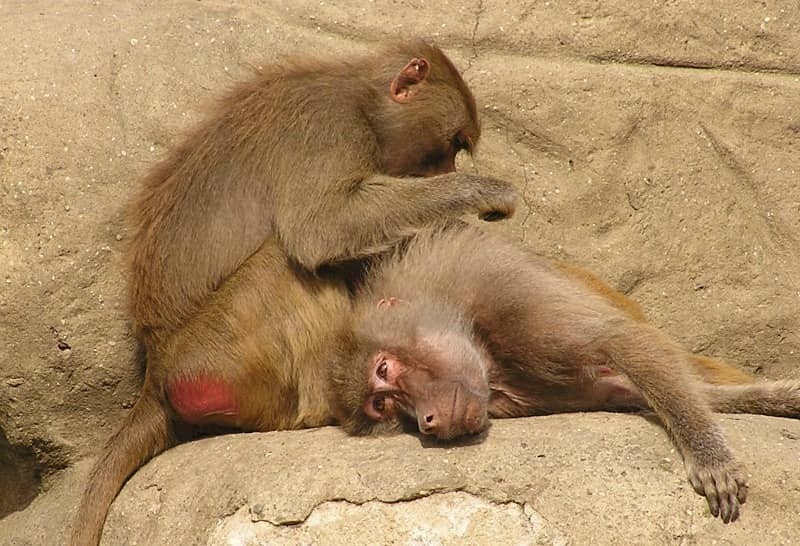 Why do baboons constantly groom each other? The grooming activity is a key way of forming bonds among individuals as well as keeping them clean and free of external parasites. This is one of their most important forms of socializing. Grooming strengthens the bond between allies that might assist when there are disputes over food. These alliances will also be useful in dominance fights particularly when they fight for females where the ally might assist in clashes with rivals. Generally the grooming strengthens the overall cohesion of the group and reinforces hierarchies. Troops have home ranges but are not territorial. They will tend to avoid other troops. Each troop occupies a home range. The collective noun for a group of baboons is a "troop"
A home range needs to contain refuges for sleeping, sufficient food, and it must have a source of water. The best refuges are cliffs, caves and large trees as they are relatively secure against predators. Such a home range sometimes overlaps those of other troops. If they do share the use of an area they will tend to avoid each other. When meetings do occur the adult males display their dominance hierarchy. You can notice how they do this when stare at each other and when they draw their lips back in order to expose the canine teeth. Do they sometimes form relationships with other animals and if so why? Some troops can sometimes be seen moving around antelope like impala or nyala. The reason they do this as firstly that they get on with each other because they do not compete directly for food. The biggest benefit from sticking together comes from the mutual vigilance. They can help each other in terms of strengths in numbers and the added sense i.e. extra pair of eyes they need to detect common enemies. A female can come into heat at any time of the year. She solicits mounting from males by presenting her rump to them. She may also flash her white eyebrows at a male. The most obvious sign of her receptivity is the swollen, bright red skin on her rump. It has to be red to attract the attention of the males. A female may consort with a single male for several days at this time. During this time they sleep and forage close to one another the male may groom the female or supply her with food. During the early part of her receptive period a female may mate promiscuously with several of the troop low ranking males. Mating late in the cycle, when the chances of conception are highest, is reserved for the dominant male. How are the babies taken care of? A mother carries her newborn baby clinging to her belly. When it is old enough to walk it rides on her back. Initially it lies on her back face down and later sits up, using the raised tail as a backrest. If its mother refuses to give it a ride a baby will throw a tantrum just like a human child ! 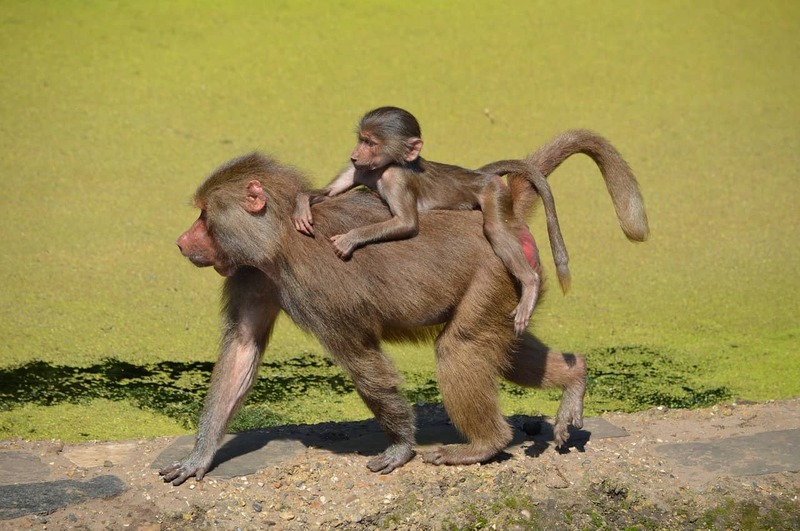 The babies will often hitch rides from its adult companions. High-ranking males often play with and carry babies. A female inherits the status of her mother. Females stay in the troop they were born in. Some males emigrate when they are seven or eight years old and move from troop to troop, staying in each troop for months or years. What is the benefit of living in large troops? 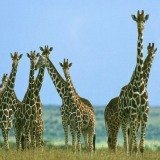 These African animals are intensely social. They live in female bonded troops of between 4 up to about 100 individuals. The average troop size is about 40. The benefits of shared knowledge about their environment, shared vigilance, and strength in numbers against the attacks of predators. Are there disadvantages of living in large troops? 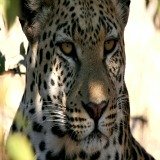 Although living in a troop has the benefit of the extra pairs of eyes increasing the chances of spotting predators like leopards, it also heightens the competition for food amongst the individual members. To make sure your counterparts don’t steal your food baboons make friends. 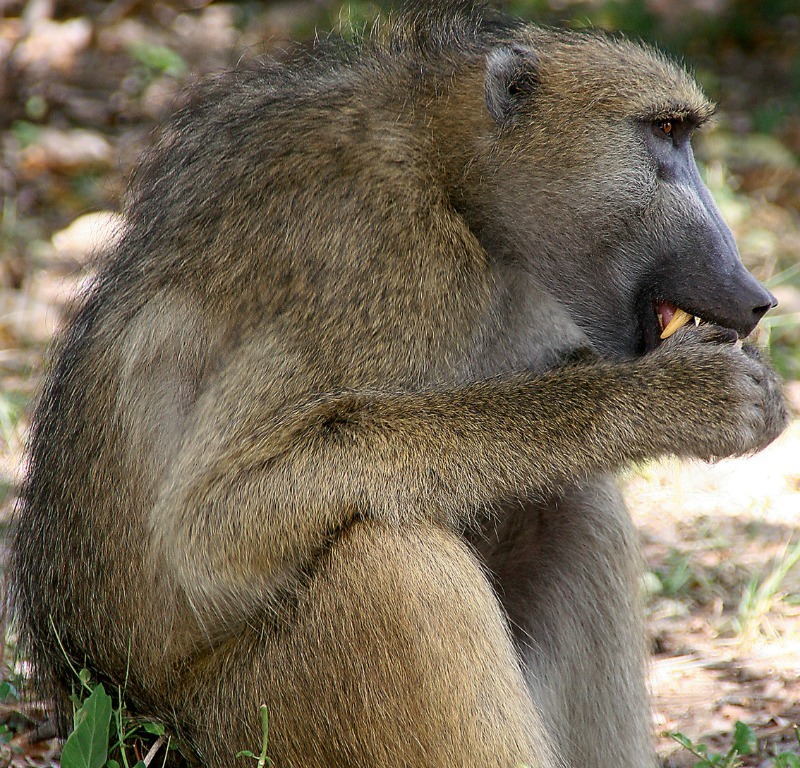 A baboon that strikes a rich and tasty food patch will secretly stuffs as much food as it can into its cheek pouches. It will then quietly move to a safer place to chew and swallow unhindered at their leisure. How would you describe a typical day of African baboon activity? These African animals usually leave their overnight cover at first light, assemble and then move off together. They will sit in small groups grooming each other while the juveniles play. They will then move off and start feeding. They often travel five or six miles a day. A foraging troop spreads over a wide area with its dominant males in front and at the rear. High-ranking females, which are more likely to have infants, are likely to be in the center of the troop. Other adult males will guard the flanks and often pause in their foraging to sit and watch for danger. If alarmed the troop will bunch together and flee to the nearest cover or vantage point. The younger males will guard the flanks and the largest, most dominant males the rear. The males are formidable combatants and can if they stick together even kill a leopard. They forage for about three hours in the morning and in hot weather they will take a midday siesta. They then start to forage again later in the afternoon while they head back towards their sleeping site. Before retiring, they will most likely spend more time in mutual grooming.